Here’s all the gory details of Berry’s Birth! It couldn’t have been more different from Plums (Reuben’s). But the end result was the same – a beautiful, healthy baby boy for us to love. What could be better? During the day I had felt exhausted. Berry was a week overdue at this point and I was just having a day where I felt I couldn’t get out of bed. I hoped this was my body preparing me for labour…turns out it was! I started to get my first ‘twinges’. I was so excited!! It was just a few pains, few and far between. We decided to keep Roo awake for a few hours so that if this was labour then we could settle him to sleep at my mum’s. After Reuben had dinner, stories, a lovely bath and PJ’s on we decided that yes, these were definitely contractions so it was time to take Reuben to my mum’s house. During the drive contractions were 5 minutes apart but they slowed again as soon as we got there. We stayed for a lovely cup of tea and a chat, and settled Reuben down to sleep. I almost cried lying in bed with him telling him how next time I saw him it would be with his baby brother! I love Reuben so much and I was so concerned that a new baby would change everything. Contractions were every 15 to 30 minutes overnight and although painful they were actually quite manageable. I slept between each one and just got up on my hands and knees and rocked during each contraction. I managed by myself for a few hours, then started waking Simon by clutching on to him during each one! We decided to get up and have breakfast as we weren’t getting much sleep. I bounced on the birthing ball while watching TV and breathed my way through contractions which were coming every 7-20 minutes. They weren’t consistent yet so it was all just a waiting game. I was still coping with the contractions very well. They were much less painful than last time! We went for a long walk along the river and round the town. Thankfully as it was a Sunday and drizzling there were very few other people about to see me groan!! I had to stop and cling on to Simon for each contraction. Finally the contractions were every 5 minutes so I phoned the hospital but they suggested I wait a bit longer as at the moment I was still coping with no pain relief so they might drop off and become less frequent again. Simon really was great during this bit. For some reason different things helped with each contraction. For some I wanted his help, for others I couldn’t have him touch me. He seemed to instinctively know what would help, whether it was rubbing my back or just holding my hand – he got it right every time without me saying a word! The contractions were still every 5 mins and had got more painful so we set up the TENS machine which worked really well. We went to the hospital where I had chosen to have the baby at the new Birthing Centre rather than the Delivery Suite. This made a huge difference! The Birth Centre is like a little self contained flat with 2 active birth rooms, a recovery room and a kitchen. There is just 1 dedicated midwife and 1 student midwife so only 1 woman can be in active labour at any time. Thankfully no other women wanted to use the room while I was there, so I got to use it 🙂 The room has a water bath, armchair and a large low bed. This was so much more tuned towards active labour than being on your back on a high up bed in the delivery suites. I was 4cm dilated so I was admitted and the midwife just left the room for me to get on with it! I wandered around a bit then sat down for a bit and we discovered that as soon as I sat down or lay down then my contractions slowed dramatically. Even sitting on a birth ball or on all fours made it slow! So I had to stay standing up and pacing the floor the whole time! Now the pain had dropped down to my hips, which felt like they were tearing apart, and my feet which were tired from all the standing. The TENS machine was great during this stage. I would put it on boost through the most painful first part of the contraction then tapered it off. Even if it was the purely psychological aspect of pressing a button, it helped! I was checked and found to still only be at 4cm. I was devastated! The midwife broke my waters and that sped things up. I was on my back while my waters were broken so I had 2 contractions on my back. These were much more painful than when I had been standing up!! So with help I got back to my feet and now the contractions were every 3 minutes. By this point the TENS machine was useless and I was on gas and air. I asked to get in the water bath and it was such a relief! The contractions were coming fast now but at least with the water taking the weight I could comfortably be on all fours. I was suddenly surprised by my body pushing!! I realise now that with Reuben I had never got to this point of feeling the urge to push. It’s the strangest feeling. You’re breathing through your contraction then all of a sudden your body decides to turn itself inside out and you lose all control and start to push. I could not have stopped if I tried, my body just completely took over. Then came the point where I actually did push the head out, which felt totally different! That was the real ‘ring of fire’ moment! Emotionally it’s a confusing time. On the one hand you really want that baby out! On the other, pushing is causing your body to rip. You can feel it ripping and breaking. Your mind is caught in an “I want to push/ I don’t want to push!” loop and you need your partner and midwives to give you encouragement to continue. The shoulders came out (less painful) and he was passed between my legs and then onto my chest as I sat back. He didn’t cry immediately but did after he was rubbed a little. He was so cute and perfect! I got to hold him until the cord stopped pulsating, then Simon held him while I delivered the placenta and was stitched up. I became very lucid all of a sudden and looking over at Simon holding Berry on the armchair made me see all the blood on the floor, around the water bath, on the couch bed and my legs. Ugh!! I think it’s about time evolution caught up and made childbirth painless and easy. While I looked over at Simon holding our precious newborn I was in awe and disbelief. A whole new little person had just entered the world. Unbelievable!! I thought I’d just add a bit here about the difference in birth experiences from my point of view. Not everyone can give birth in a birth centre, (there are certain criteria you have to meet ) but if you can then I would recommend it. It was a lot more relaxing to be in a place where birth was seen as a natural process, rather than a medical procedure. 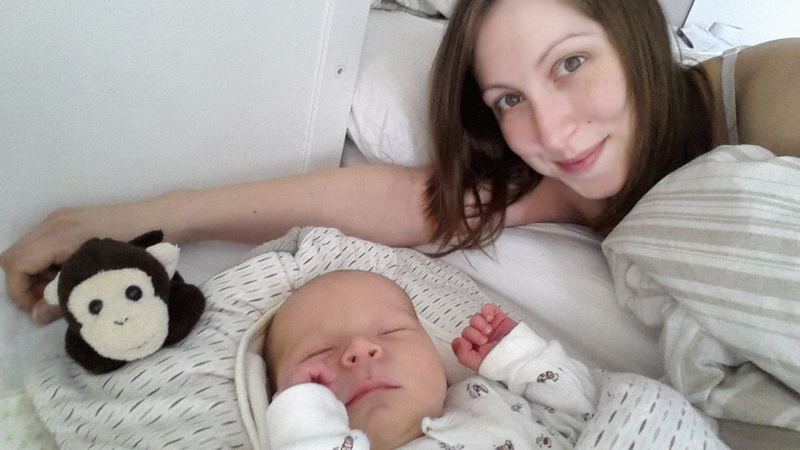 I was given encouragement by my midwives and made to feel that everything was straightforward and going well and that a natural birth was achievable! Looking back, I now feel that Reuben’s birth could have gone very differently. For a start, I was labouring on my back on a high up bed. I was attached to a drip and foetal heart rate monitor so moving around was very difficult. Now I know that my labour progressed a lot quicker when I was standing this time round, I wonder whether Reuben’s labour would have progressed faster if I hadn’t felt tied down. Secondly, during Reuben’s labour the foetal heart rate monitor showed a depression during every contraction. They told me the baby was in distress and so I had to push him out before I felt the need to push. This possibly contributed to his shoulders getting stuck and the need for an episiotomy and ventouse. This birth was debriefed with the head of the Birth Centre who said she wouldn’t have been concerned with such a slight depression and would have let the birth progress naturally. In fact, in the Birth Centre they only monitor the baby’s heart beat between contractions, every 15 minutes. So a slight depression wouldn’t have been picked up anyway. The birth centre atmosphere was a lot more respectful and caring towards me. They seemed to have the attitude that I, as a woman, could get on with labour naturally and without intervention. There was no condescending remarks like “Be a tough cookie” and my consent was asked for for everything. There were no doctors around so the midwives had more autonomy and I was told they felt like they could do the job they were trained to do more, rather than just assisting doctors. Coupled with the private recovery room (no ward, yay!) and Simon being allowed to stay as long as he liked, it was just overall a better experience.